In anticipation of Christopher Nolan’s The Dark Knight Rises the finale of his Batman trilogy, my chosen iconic Film Location this time round is from the film that started it all – Christopher Nolan’s 2005 Superhero masterpiece Batman Begins. 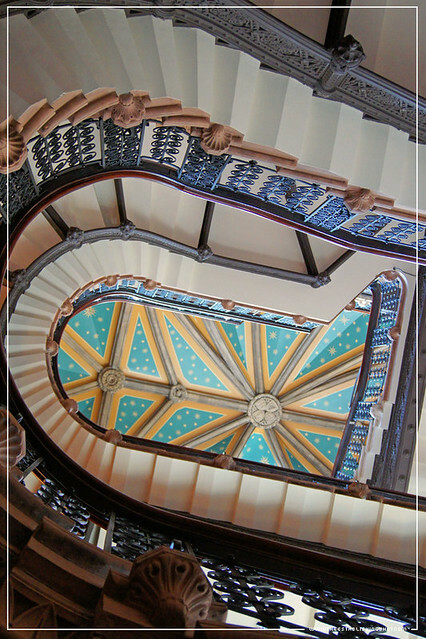 As well as locations in Hertfordshire where Christopher Nolan went to school, Nolan has a fondness for London locations that he knows and likes. Having spent time in London studying at both the University College London and Raindance Film School. 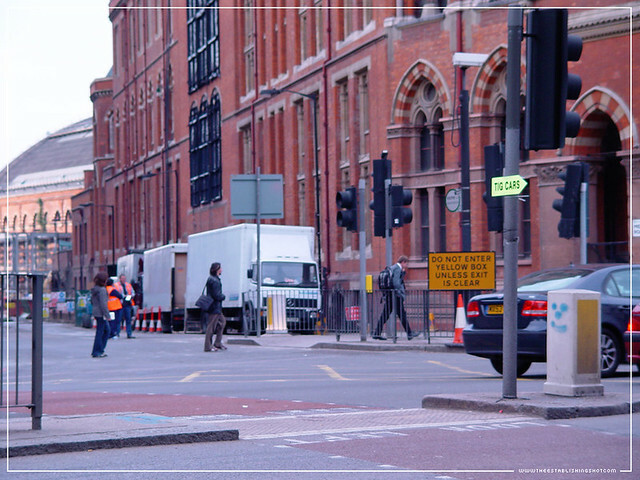 Nolan knows his way around London and certainly has favourite locations that he re-uses in a number of his films. Back in 2005 Christopher Nolan was on the cusp of greatness making his first mega hit Batman Begins. Batman Begins not only heralded in a new age of Super Hero films by staying true to the spirit of the dark and complex comic character, it also paved the way for franchises to reboot in an intelligent way without marginalising fans as well as cementing Nolan’s bankability and blockbuster status. 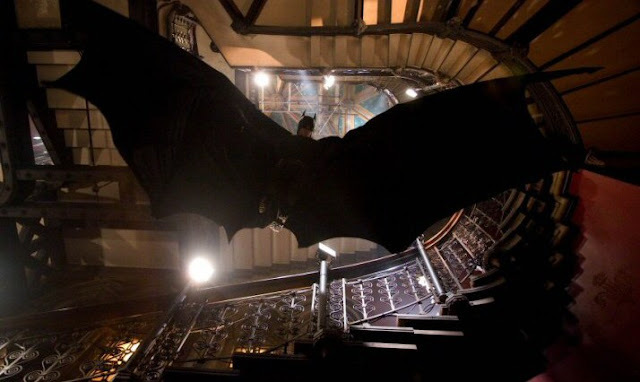 Batman Begins was shot over 3 countries; Iceland, USA and United Kingdom under the name The Intimidation Game or TIG to minimise attention being drawn to the production. 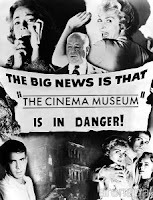 It did reasonably well at the box office but more importantly it was the first super hero film to garner as much critical acclaim across audiences, industry and critics alike. In the wake of his parents' murders, disillusioned heir Bruce Wayne travels the world seeking the means to fight injustice and turn fear against those who prey on the fearful. With the help of his trusted butler Alfred, detective Jim Gordon, and his ally Lucius Fox, Wayne returns to Gotham City and unleashes his alter ego: Batman, a masked crusader who uses strength, intellect, and an array of high-tech weaponry to fight the sinister forces that threaten the city. 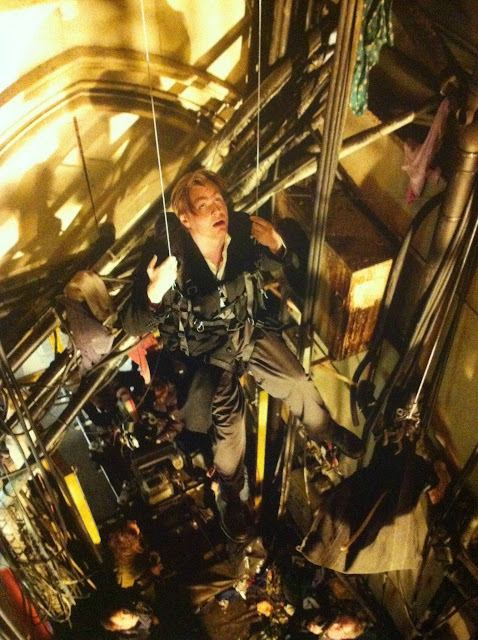 A memorable and favourite scene from Batman Begins is the “Backup” scene. 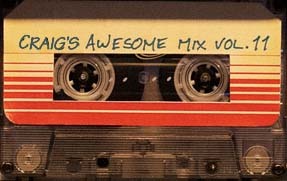 Where Batman (Christian Bale) is trapped in Arkham Asylum along with a heavily drugged Rachel Dawes (Katie Holmes) on one of the higher levels. 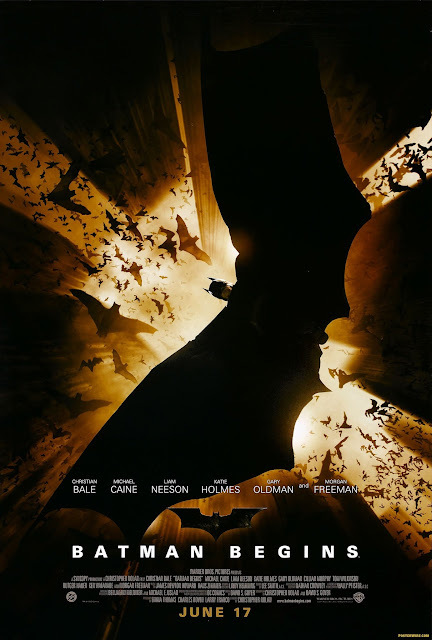 Video: Batman Begins Scene: "Backup"
The Batman Begins screenplay was created by Christopher Nolan and David S. Goyer based on a story by David S. Goyer. Whilst it has been cited that the Batman Begins storyline was influenced by; The Man Who Falls, Batman: Year One, and Batman: The Long Halloween comics. The Backup scene is almost lifted frame for frame, from issue 3 of Frank Miller, and David Mazzucchelli’s Batman: Year One. The Backup scene is visually stunning and Nolan takes what should be a completely ridiculous and un-filmable scenario and makes it seem plausible. At the same time lifting the Batman character to larger than life proportions. The setting of the scene lends a Gothic and magnificently dark tone to Arkham Asylum. Gordon tries the elevator- it is dead. 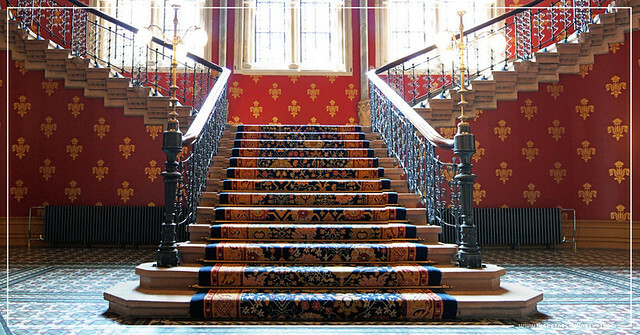 He enters the STAIRS. Arkham is surrounded by the Gotham Police Department who are waiting for the heavily armed S.W.A.T. team to arrive. 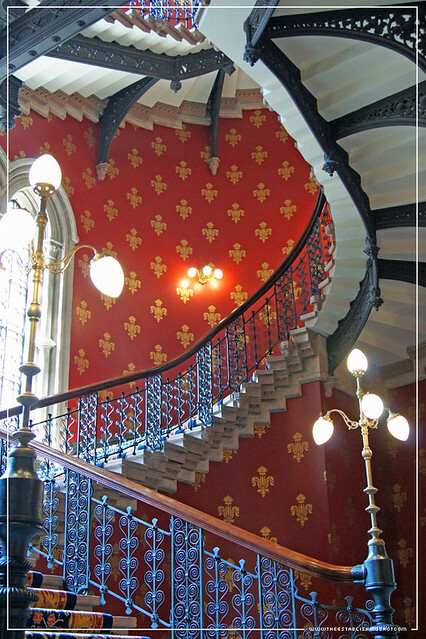 Commissioner Gordon (Gary Oldman) enters the building alone and we see him move along a corridor, turn left and find a grand staircase leading up. Suddenly Batman catapults down the stairwell and lifts Gordon up in his cape. Around this time S.W.A.T. enter the building moving quickly along the same corridor and start heading up the staircase. Crane poisoned her with his toxin. He was the third man at the docks. They can’t help her. But I can. and Gordon are in the shadow of the attic. heel, producing a barely audible HIGH-FREQUENCY WHINE. alley on the Narrows side. refining his toxin, stockpiling it. Gordon frowns at the loud SQUEALING noise. Gordon covers Rachel as he carries her down the steps. Bats CYCLONE down the stairwell, FOLLOWING the signal. Forcing Batman into activating a sensor in his boot which sends an ultrasonic tone out designed to attract bats. And when they arrive they arrive en mass and swarm in causing chaos. 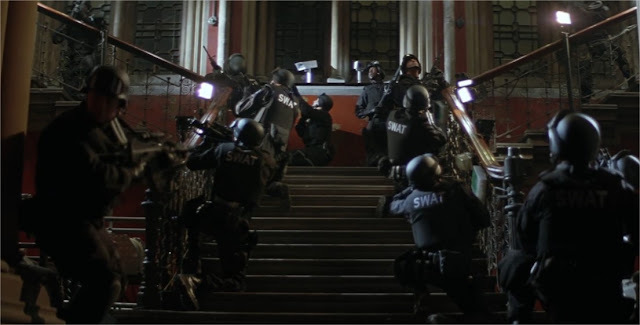 Using the bats as cover Batman glides down the stairwell distracting S.W.A.T allowing Commissioner Gordon (Gary Oldman) to escape with Dawes. 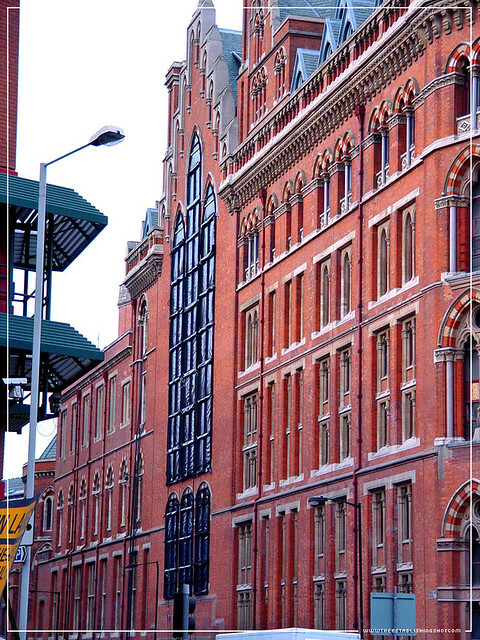 The scene was filmed at the imposing and gothic Midland Grand Hotel in Kings Cross, London, newly refurbished and now known as the St Pancras Chambers or St. Pancras Renaissance Hotel. 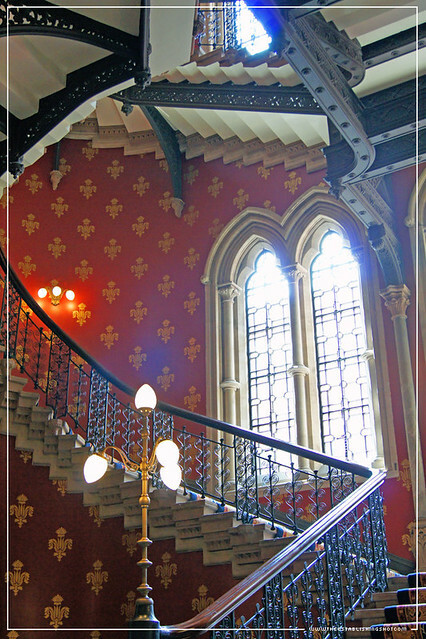 The St Pancras Chambers are a grand Victorian and iconic architectural landmark which escaped demolition in the 80s to make a comeback this year after a £200m makeover as part of the new St. Pancras Renaissance Marriott Hotel. 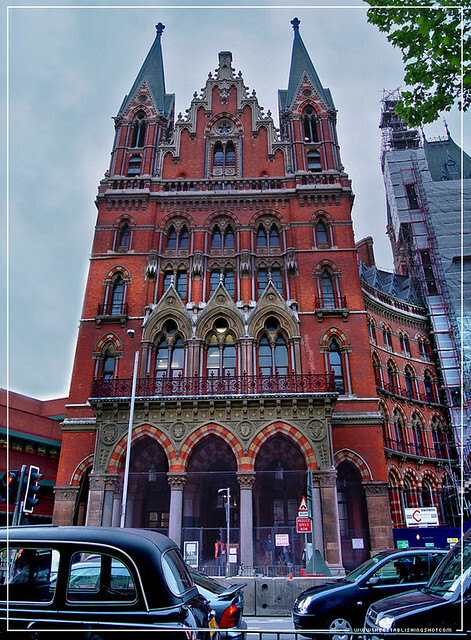 The St Pancras Chambers have also been used in other films such as; The Colin Firth starrer - Trauma, The Secret Garden, Richard III, Chaplin and in 1989 The Midland Hotel was used in another Batman film. For Tim Buron’s Batman a room in the hotel was used to double as a Gotham Globe newsroom.